Elsie M. Campbell and Aunt Mimi's Quiltworks: Winning Stitches! 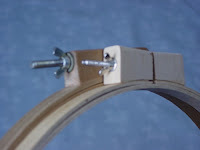 First, you'll need a few simple tools: 14" quilting hoop, quilting thimble, quilting needles, thread, and a product I helped to develop Needle-Grip-Its. And of course, your marked quilt sandwich. 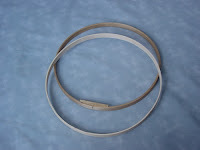 I've used the quality hoop since 1982! The cheap hoop broke in half shortly after these photos were taken. Next, you'll need a thimble. 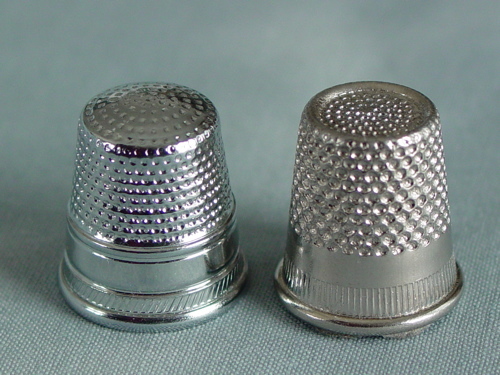 You won't need the expensive ones here, but you do need to know the difference between a sewing thimble and a quilting thimble. 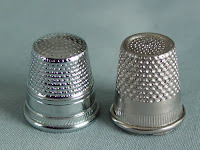 A quilting thimble will have a deep depression that allows you to control the needle while 'rocking' it. 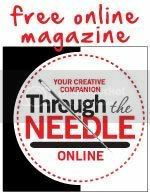 Your needle will simply slip off the tip of a swing thimble, making it impossible to get close, even quilting stitches. 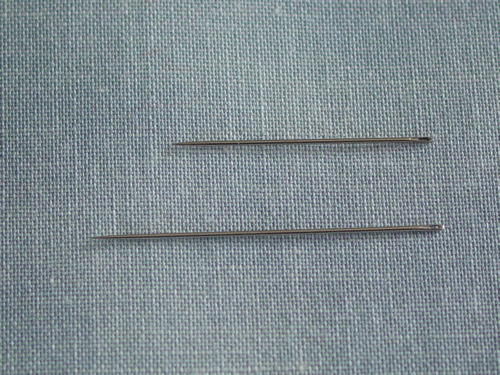 Quilting needle, top. 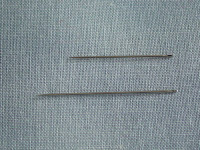 Sewing needle, bottom. Third, choose a quilting needle. My preferred brand is the John James Gold'n Glide Size 11 Big Eye Quilting Needle. 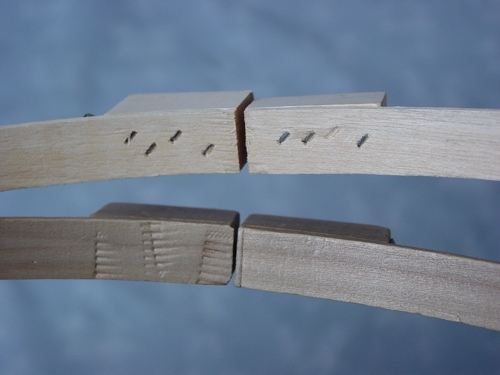 A quilting needles is technically called a 'between' whereas a sewing needle is a 'sharp'. 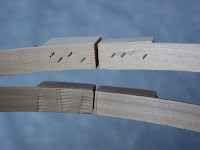 The difference between the two is 1/4" in length with the quilting needle being shorter. 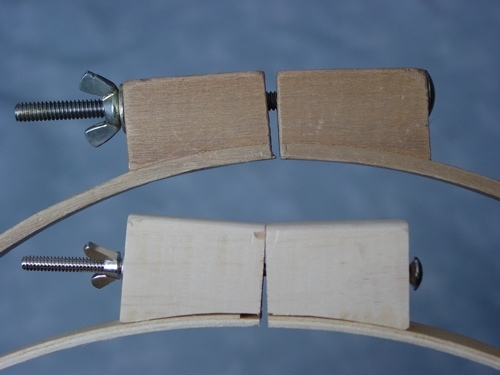 This allows better control of the needle during the rocking process. As for thread, my favorite is actually a sewing thread, Mettler Silk-Finish 100% cotton. It is strong enough for hand quilting, and fine enough that your stitches will look smaller and more even than heavier threads. 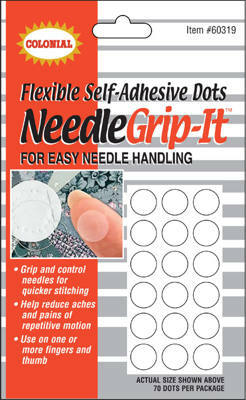 Another product I love to use for hand quilting is Needle-Grip-Its. I use this product on my thumb and forefinger of my preferred hand to allow for easier gripping of my tiny needles, and on my underneath fingers to protect them from needle pricks. Now you're ready to start! Begin by hooping the quilt. Remember not to pull the quilt tight in the hoop. It should be smooth, but have some play in it. The hoop is only to free up both hands to work together to create the stitch. 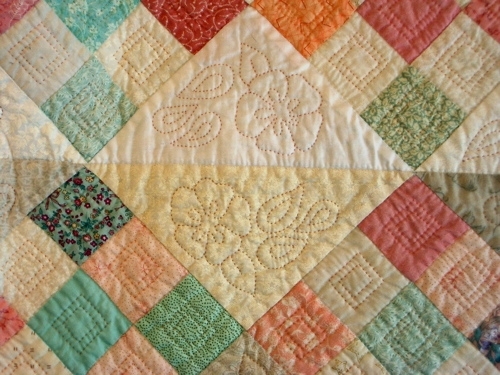 Ideally, the quilting stitch will look the same top and bottom. Because the needle is a stiff piece of metal, it will not bend to stitch straight down and then straight up to create the perfect stitch. But fabric is flexible. 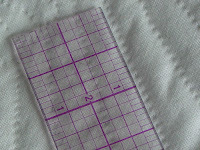 So the idea is to bend the fabric around the point of the needle. 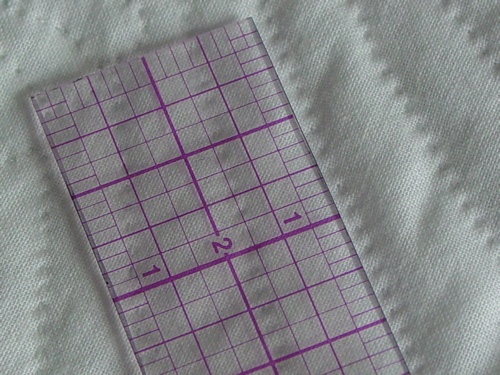 To do this, you will stick the needle down in the quilt sandwich perpendicular to it, transfer the eye end of the needle to the end of your thimble, rocking the needle horizontal and bending the quilt sandwich into the vertical position before driving the needle through it. I will upload and insert a video of the actual hand quilting process in my next blog. (I'm having some technical difficulties uploading my QuickTime video, and need some more expertise here.) 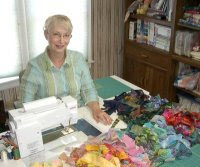 In the meantime, you can get your hand quilting equipment out and get ready to practice your hand quilting stitches! From now until New Year's Day, I would love to send you a copy of my Winning Stitches book for FREE! Just order any one item from my website at regular price, even if that is only a $9 pattern, and I will include a copy of Winning Stitches in your package. Found you through the quilting gallery blog. Your star quilt was fabulous! I have not hand quilted before but I want to start. I've started gathering supplies. I look forward to your sharing. Share some star quilt stuff too. Anything star just makes my heart dance a jig! I'm struggling with my quiktime video. It won't upload to blogspot. Do any of you have suggestions?